This workshop will teach more advanced methods of synthesis and functions of synthesizers. 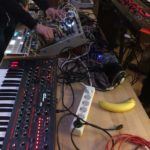 The information in this workshop can be applied to all types of synths – hardware or software, modular or not modular. This workshop will assume previous participation in the Intro to Synthesis workshop or previous knowledge of the basics of synthesis and acoustics. Questions that will be answered are: What is ring modulation? 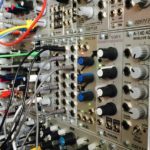 What is FM synthesis? How do you make a sound that sounds like a metallic bell, versus a vibrating string? How do you make a sound that is complex and “alive”? What are some strategies for using other common functions of synthesizers such as portamento, mono/poly, and arpeggiators? These topics and more will be covered in the workshop.